Founder of technology startup theright.fit, Taryn Williams, discusses how her three-year old business won Mumbrella's Award for Innovation and shares what she believes the word means in today's media landscape. Taryn Williams, the CEO and founder of digital marketplace theright.fit, built her now award-winning business when she “fell in love with using technology to solve problems”. Williams, who founded the digital marketplace which directly connects creative talent with clients, tells Mumbrella her business was born from the idea of being able to use an app which would enable her to check model availability for clients. 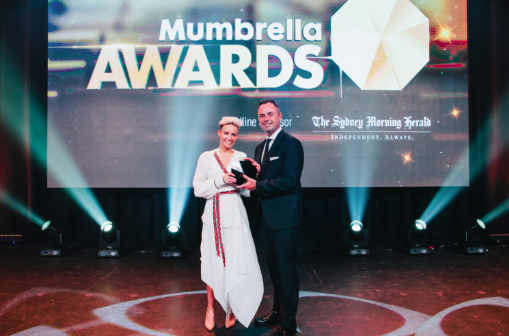 Winning the Mumbrella Award for Innovation earlier in the year, Williams says when her business was born in 2015, the “industry was really ripe for disruption” and there was a push towards smaller businesses, “budgets were changing and brands needed social media influences to amplify campaigns”. “The type of talent required in campaigns were more authentic and included a much broader range of demographics,” she explains. Williams says it was through her modelling agency Winx that she noticed there was a gap in the market for a more sophisticated technology platform. “I built an end-to-end on-boarding counter management payroll integration software first for my first business model and it was an incredibly time consuming, incredibly painful and expensive process. “I thought if I could build this product for Winx, if only I’d built it in a way that could be opened up and our clients could actually utilise a platform to post their own jobs and find their own talent for bookings, but obviously it was not that simple so it gave me the idea to build a marketplace that really solves all the pain points of the creative industries,” Williams says telling the story of how she came up with the business idea. Building a platform which “streamlined” a process which had traditionally been “so convoluted” and “time consuming” for clients was a focus for Williams when launching her business. After beating out competitors in the Mumbrella Award for Innovation category – including Host/Havas, Clemenger BBDO Melbourne, Saatchi & Saatchi Sydney and 90 Seconds Australia – the jury said Williams’ business is a “disruptive platform that helps clients source talent, creators, producers and much more to develop content faster, cheaper and easier than current processes without compromising on quality or engagement opportunity”. Outlining how theright.fit came to fruition, Williams explains that the platform itself is inherently innovative as it involved conducting a lot of user research, testing, technology and talent. “We spent a lot of time mapping out user journeys and the stories of how they would go about interacting with our product and the pain points that they have with the current system of using traditional off-line talent agencies and production agencies. When awarding theright.fit, the jury also noted Williams had not only developed and built her business quickly but also continually improved the platform. Acknowledging the jury’s accolades the founder and CEO of theright.fit says the path to success has definitely had been “challenging” and “crazy”. “Obviously having a great team really helps. We raised venture capital fund about six months in which obviously gave us the additional capital to throw fuel on the fire and that meant either being able to hire great people and hire more engineers so that we really could build the product as quickly as we needed to and build out a team of marketing and salespeople to get the word out there. Having held positions in event production and ad tech companies, Williams says when she launched theright.fit she set out to find “a world class team”. Recognising talent as a challenge in the industry, Williams admits having a “strong brand and strong PR” helped her recruit top talent and hunt for people who wanted to work in a startup. However, Williams says tracking down talent who wanted to work in the gruelling market of startups was a challenge. But for Williams, one of her biggest focuses is not just having an innovative business but constantly reinventing it. The key to this, Williams shares, is keeping up with the needs of clients. Part of this includes keeping up with overseas trends, listening to the market, assessing where marketing dollars are being spent and being on top of new platforms. Williams also notes how integral customer interaction has been when building her business, warning other business owners “you can’t build in a silo”. “You can think that you’re building the most incredible product that solves everyone’s needs but if you’re not talking to customers and potential customers on a day-to-day basis you don’t actually know if what you are building is what they need.